Gardeners desiring a reliable flowering plant that will bloom throughout the summer often select marigolds as bedding plants in sunny flower gardens. Many varieties of marigolds exist to provide a gardener with a generous selection of these sunny bloomers. Some marigold varieties grow up to 3 feet high, while other varieties stay more compact to provide colorful borders. The size of the blossoms varies as well, with some blooms as large as 5 inches wide and others only 1 to 2 inches in diameter. Select the marigold variety you desire and plant marigold seeds indoors before transferring them outdoors. Fill each peat pot to the top with potting soil and spray the surface of the soil with the spray bottle to make the soil moist. Place the peat pots into the shallow tray. 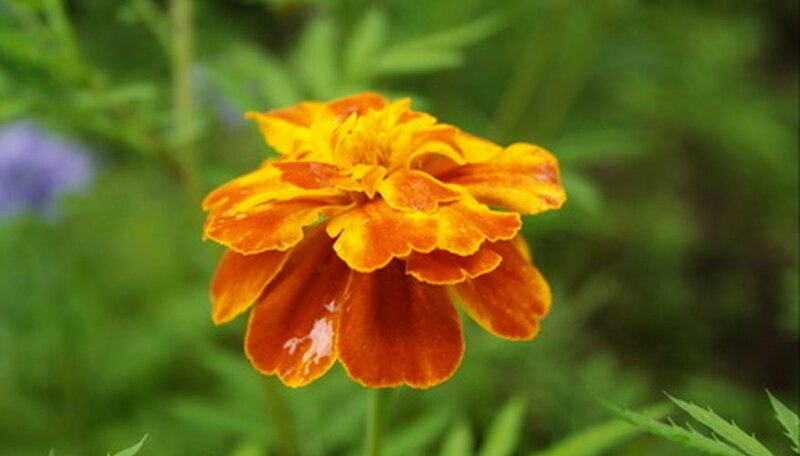 Place two marigold seeds on top of the soil in each peat pot about 1 inch apart. Cover the seeds with one-eighth inch of potting soil. Set the seed tray in a warm location with temperatures near 70 degrees Fahrenheit. Light is not necessary for germination. Spray the soil surface daily with the spray bottle to keep the soil moist. Watch for the seeds to sprout within one week. Remove the weakest seedling from each peat pot when the seedlings are at least 3 to 4 inches tall to leave one seedling growing in each pot. Transplant the marigold seedlings to a sunny growing area after the final frost of the spring and when the seedlings are at least 6 inches tall. Space the seedlings 6-to-8 inches apart and dig holes large enough to plant the entire peat pot beneath the soil surface. Water the newly transplanted marigold seedlings well immediately after planting them. Water the marigolds during the summer only during periods of drought. Deadhead the faded blossoms to encourage continued blooming.